Why own an electric bike? Beating the hills, exploring the world whilst keeping fit, saving money and having fun! That is what owning an ebike means. Electric bicycles offer the same benefits as regular cycling; the difference is due to the motor and the power setting you choose. Every time the pedals are pushed you’ll get three, four, five or maybe even 10 pedal strokes more. This means greater distances and longer rides. Great news for the heart, lungs and blood pressure as endless scientific study has proven the link between regular exercise and reduced stress levels. According to a report by the Transport Research Laboratory, regular bikes are taken out of the shed less than 25 times a year, with 46% being used just once or twice a week. In comparison, 30% of people with electric bikes use them every day, while 81% ride them at least once a week. 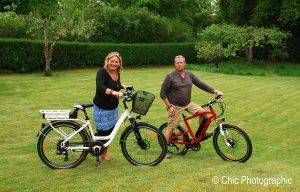 E-bikes are also good for those whose fitness isn’t what it could or used to be due to age or illness. The average speed of cars in central London is 7.4mph! On an e-bike 15mph can almost instantly be reached, making them safer than ordinary bikes as it takes a few vital seconds for a regular cyclist to build up speed when stopped at junctions, crossroads and roundabouts; which is where most bike accidents on the road happen; due to the instant acceleration from the motor a faster exit from the danger zone is achieved. Ebike riders are also less likely to jump a red light and are more willing to slow for bends and corners; where many cyclists come off. Finally, being able to keep up with the flow of traffic more easily means, fewer cars, buses and lorries feel the need to overtake, making for safer riding. With the many choices of stylish electric bikes and accessories now available; many have swapped their cars saving money on commuting as well as saving the planet making ebikes the “coolest way to travel”.